Khullar befriended and embraced the concept of risk as an integral part of education and research. His successes enrich the doctoral degree he will receive this May from the Chester F. Carlson Center for Imaging Science. Momentum from a string of positive research opportunities has positioned Khullar to stretch his imagination as an employee at one of the world’s most famous corporations. Earlier this year, he knocked on the window of his dream job at Microsoft and the window opened wide. He arrived at Microsoft Research in Redmond, Wash., after finishing a fellowship at the Massachusetts Institute of Technology Media Lab where he and a select group of graduate students applied imaging solutions to societal problems. 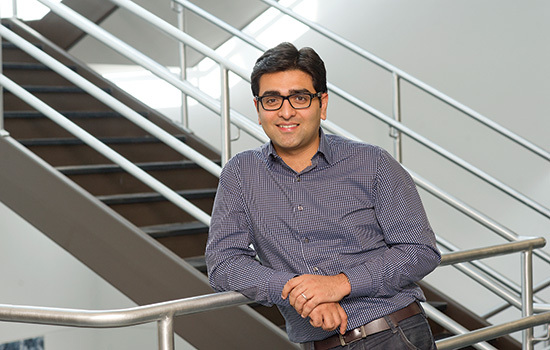 Khullar’s team developed an award-winning mobile imaging device for diagnosing eye diseases that impressed the researchers at Microsoft and segued into his internship and introduction to the company. Fast-forward to January and Khullar’s grueling two-day marathon job interview at Microsoft. He gave a presentation to a room full of researchers and stayed sharp through 11 one-on-one interviews.